This new SCP Custom Install Series cable has been ATC tested and certified to Premium High Speed HDMI® Cable with Ethernet performance standards. SCP Premium Certified cables are specially shielded to provide maximum EMI protection. 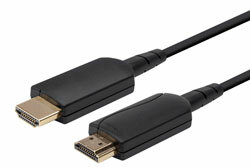 SCP Premium Certified cables are the professional's choice for 4K/Ultra HD performance and reliability.